The April establishment survey of jobs found a lot more than the market expected, but the household survey found a lot less. These two measures don't always agree every month, but over time they must. 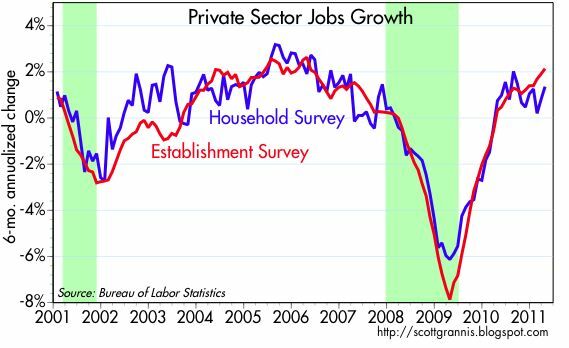 The household survey of private sector jobs is rising at a 1.4% annualized rate over the past six months, while the establishment survey is registering a 2% annualized growth rate. 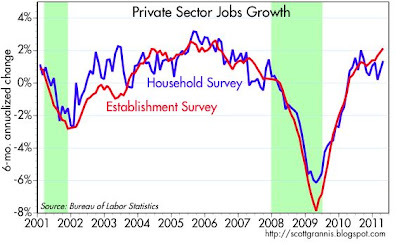 Both show that the private sector has added about 2 million new jobs since the low in late 2009/early 2010. Things are picking up and the outlook is getting slowly better, much as I anticipated last January. 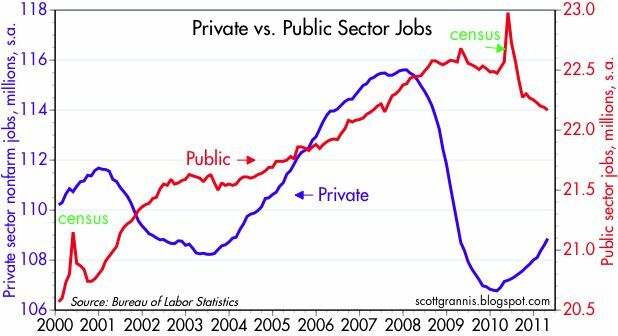 Although painful for those affected, from an economist's point of view it's also good to see the ongoing reduction in public sector employment. Shrinking the size of our bloated government is an essential ingredient to boosting the economy's ability to grow. This is a process that is likely to be underway for a long time. A reduction in government spending frees up resources that can be better utilized by the private sector; it's that simple. Although it doesn't make sense to Keynesians, the best stimulus for our economy at this time is a reduction in government spending. It's happening, and it's ongoing, and that is good news. 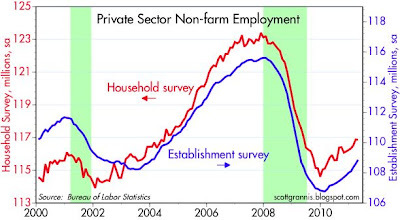 The upward tick in the unemployment rate, from 8.8% to 9.0%, is essentially meaningless, since it comes from the household survey, and as you can see from the top chart, that survey produces erratic results from month to month. The thing to focus on is that fact that the pace of new job creation in the private sector is improving, and it has already improved enough to generate a gradual reduction in the unemployment rate over time. I should add, of course, that today's employment report gives the lie to the weekly unemployment claims data. As I argued yesterday, the sudden and outsized gain in unemployment claims in April was most likely due to faulty seasonal adjustment factors, and today's employment report confirms that. I rely on Scott to keep me from being too negative. When I see in Table A or A-1 (you don't have to go deep into the report) that the number of people employed dropped 190k from last month and from a year ago we are up only 292k employed I go way negative on the economy. (The markets are a diffennt matter). Glad to see improvement, but we still have about a 5 percent lower labor participation rate than before the Great recession. I know guys in their 50s, who have sent out 200 resumes with minimal responses. One guy pays $400 a month for health insurance for himself (his COBRA expired), and his slightly older wife has to pay $700. Really, as I am in the 50s age bracket, I know a lot of people in this age bracket. I don't see many of these fellows ever getting a job again, and I hope I am wrong. 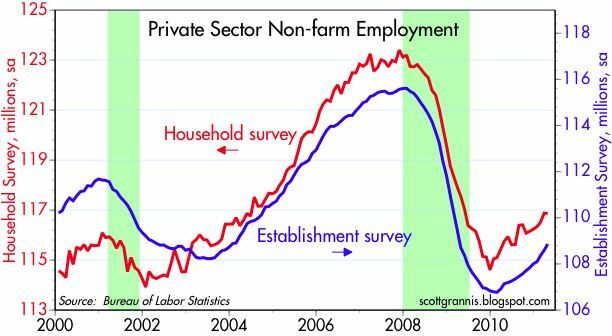 As for trimming bloated government payrolls, be my guest. Have at it, please. And use not an axe, not a chain saw, but a bulldozer. Thank you again for blogging. I learn a lot about economics here. I have a question. You often say that growing government hinders economic growth because the public sector is less efficient than the private sector. Can you briefly articulate the reasons why with some empirical justification. 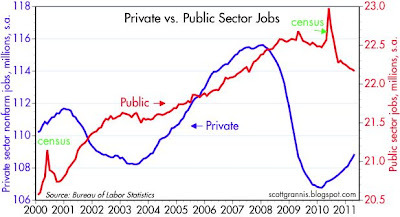 A lot of people just don't believe the private sector is more efficient. I can make a case, but I suspect you could do it much better. Since ignorance is a renewable resource, would you consider devoting a blog entry to make the case? Thanks.